The City of Grand Forks, through the Boundary Flood Recovery Team, applied to Infrastructure Canada on January 11, 2019 for $49.9 million in funding for flood infrastructure. The intent is to protect both residential neighbourhoods and vulnerable areas in the downtown core, and to recreate wetland areas. The Federal Disaster Mitigation and Adaptation Fund (DMAF) program is reviewing the applications and will release the list of successful applicants in May or June 2019. The projects listed in the application come from recommendations in the Dobson Engineering report submitted in September 2018 and include work both in the City of Grand Forks, and other areas within the Boundary. Projects include re-establishing wetlands, building dikes, raising roads, installing pumps for storm water drainage, and bank stabilization. The total time to implement all stages of the proposed plan is five years after receiving funding approval. Some projects identified in the Dobson Engineering report were not included in this application because of financial limits, information gaps, or falling outside of the DMAF program’s scope. DMAF focuses on natural infrastructure, public safety, and climate change adaptation. The regional Boundary Flood Recovery team continues to research and apply for other grants, including the National Disaster Mitigation Program which was submitted in summer 2018. That application included flood protection and storm water drainage improvements for parts of downtown Grand Forks, and selection results for that grant are expected in Spring 2019. As other opportunities come up, Boundary Flood Recovery will prepare applications to fund projects endorsed by City Council and/or the RDKB Board. 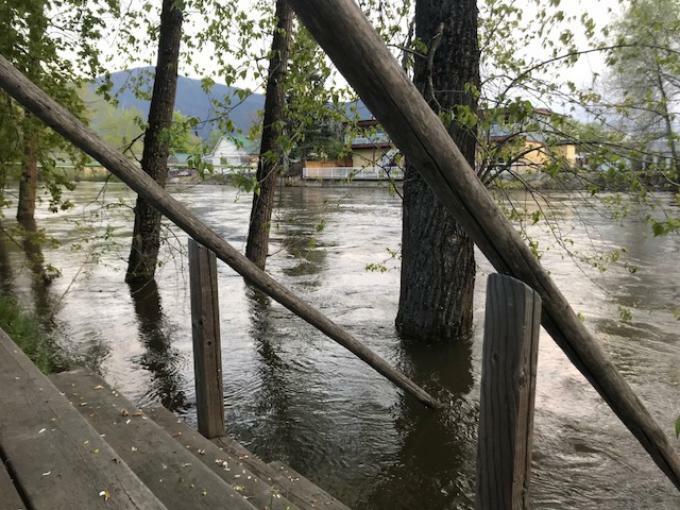 In May 2018, parts of the Granby, West Kettle, and Kettle River had flows exceeding the 200-year return period. The flooding caused over $38M in damage to agricultural operators, residential neighbourhoods, commercial areas, and industrial operations. About 1500 buildings were evacuated across the Boundary and more than 500 were damaged. Emergency responders from across the region performed thirty-eight rescues via boat and helicopter. Agricultural businesses across the region sustained millions of dollars in losses as flood water destroyed arable land and eroded river banks. The recovery plan will cost $60M from 2018-2022 and is dependent on funding from senior levels of government.